The Cold Steel Lucky One is our modern re-invention of the classic Gentleman’s pen knife. Astonishingly lightweight, it barely moves the scale at a little over 1oz, making it utterly effortless to carry. Use the removable pocket clip to wear it with dress pants or lightweight summer slacks, carry it in a shirt pocket or even use it as a tie clip, it is so thin and light you’ll forget you even have a knife – but it’s always there when you need it! 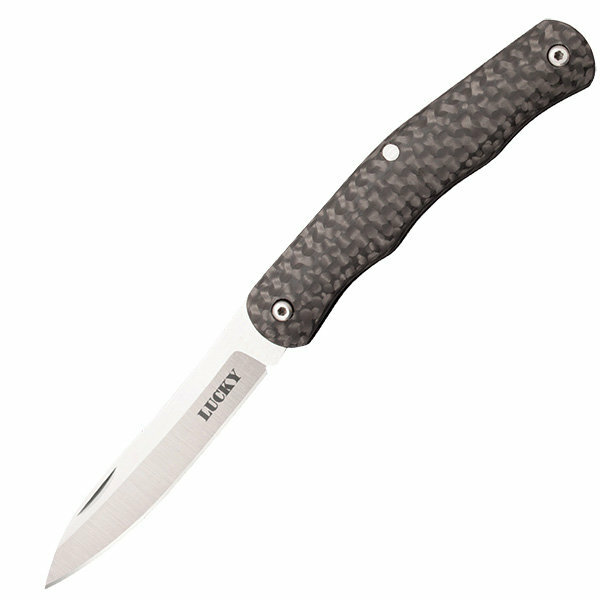 The Lucky One features one plain edge blade made from premium CPM S-35VN steel, securely nestled between two-tone polished carbon fiber scales – and with an RC of 60-61, the Lucky One takes a razor edge that will last! Stylish, unobtrusive, elegant and legal almost everywhere in the world, it’s a versatile knife that will serve you well, and look beautiful while doing it!